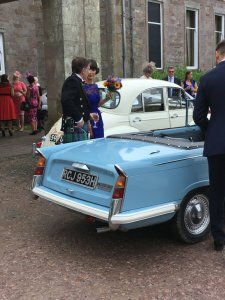 WHY CHOOSE A CLASSIC WEDDING CAR? You love vintage style; you are having a “vintage” wedding, or you even have a ’50s or ’60s style dress – so a vintage or classic car is a no-brainer. But even if you are not particularly into the “vintage” scene, a classic car might be a good choice for your wedding. 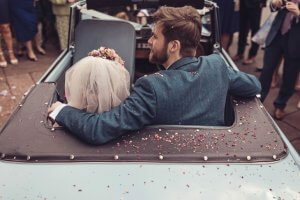 Who doesn’t want the opportunity to arrive and drive off in style at their own wedding? 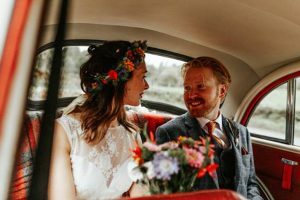 Adding to the “specialness” of the day, a journey in a classic car is a memorable experience for whoever is lucky enough to travel with the bride and groom, as well as the happy couple themselves. In our experience, classic cars at a wedding can create a fantastic talking point for guests. They enjoy looking at the vehicles; taking photos and discussing their unique characteristics. The younger guests enjoy the novelty of the old cars and the older guests like to reminisce about about the cars they once owned. An alternative to having a formal, chauffeur service, is asking a family member or friend to drive you on your wedding day. This not only, could be a more affordable option, but also gives them the unique opportunity to drive a classic car! A real treat, especially for a petrol head! 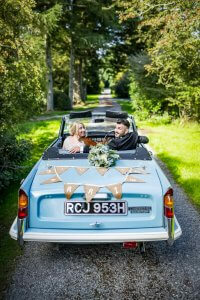 Of course, a major reason to choose a classic car for your wedding, is the photo opportunities they provide! A good photographer will make the most of a classic car’s photogenic qualities. It is fairly common these days for the bride groom, and photographer to head to a beautiful and meaningful spot for a photo session. And a classic car makes a great addition, and for some imaginative shots. Naturally, classic wedding car transport doesn’t have to be for the bride and her father’s arrival only. 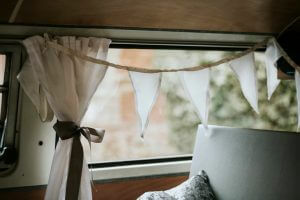 Why not arrange for the bridesmaids; bride’s mother; the groom and even the ushers to arrive in style as well?